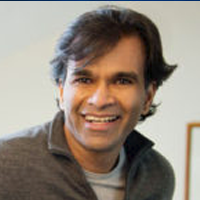 Sendhil Mullainathan is a Professor of Economics at Harvard University. His real passion is behavioral economics. His work runs a wide gamut: the impact of poverty on mental bandwidth; whether CEO pay is excessive; using fictitious resumes to measure discrimination; showing that higher cigarette taxes makes smokers happier; modeling how competition affects media bias; and a model of coarse thinking. His latest research focuses on using machine learning and data mining techniques to better understand human behavior. He helped co-found a non-profit to apply behavioral science (ideas42), co-founded a center to promote the use of randomized control trials in development (the Abdul Latif Jameel Poverty Action Lab), serves on the board of the MacArthur Foundation, and has worked in government in various roles, including most recently as Assistant Director of Research at the Consumer Financial Protection Bureau.